Author: Sabine Brüntrup-Seidemann. With a preface by: Thomas Bierschenk. Series edited by: Thomas Bierschenk, Anna-Maria Brandstetter, Raimund Kastenholz, Matthias Krings, Carola Lentz. The role of civil society in development cooperation in Africa has tremendously changed in the 50 years since independence. For agricultural development, local non-governmental organisations (NGOs) are of particular importance since the 1980s. There are mainly two roles attributed to them: As civil society organisations they are seen to advocate for human rights and democracy, and as public service providers they are said to work more effectively and efficiently than the state with and for the poor. In these roles they are sought after and promoted by the donor community. However the appraisal of their roles and work is ambivalent: On the one hand, they are appreci­ated as the hope for sustainable development, on the other hand, they are criticised as overrated actors in development cooperation. Using the example of Benin, this book discusses the roles of local NGOs in rural development and reassesses the advantages attributed to them when compared to state-controlled development pol­icy. The investigation is based on ethnographic case studies and surveys in several villages in Benin. 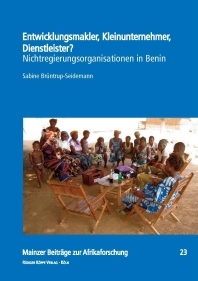 By analysing the emergence of NGOs, the motivation of their founders, their activities, their external perception, their interaction with the local population, with public authorities, donors and among each other, the book provides a comprehensive portrayal of the reality of local NGOs in Benin. The author demonstrates that donors are geared to an idealized organisational type of “NGO” which is derived from Euro-American experience but which does not match with the reality of Benin, however. This leads to high losses due to disharmonies in cooperation and even­tually significantly restrains the capabilities of local NGOs in rural development. The book accounts for the sociological comprehension of rural areas in Africa, with a main focus on societal dynamics that are provoked by external interventions. By clarifying roles and logic of action it intends to make a contribution to the improvement of development cooperation.